Chia seeds come from the plant Salvia hispanica L., and were at one time a major food crop in Mexico and Guatemala. 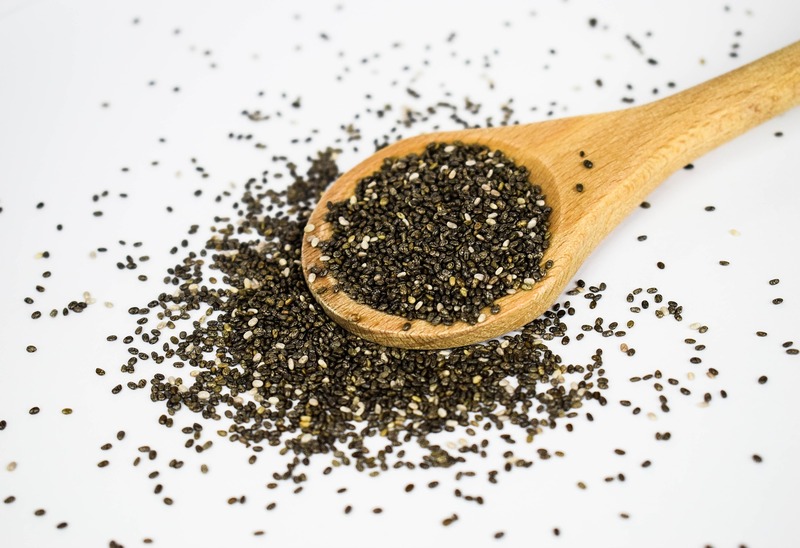 The chia seed market is projected to reach more than 2 billion USD in sales by 2022. Chia seeds are rich in polyunsaturated fats (omega-3 fatty acids), fiber, protein, calcium, phosphorous, and zinc. Two tablespoons of chia seeds (1 ounce or 28 grams) contain about 140 calories, 4 grams of protein, 11 grams of fiber, and 7 grams of unsaturated fat. They are the richest plant source of omega-3 fatty acids. Chia seeds contain several components that, when eaten as part of a balanced plant-rich diet, may prevent the development of various chronic diseases. Chia seeds are high in fiber, providing 11 grams of fiber per ounce. Being high in fiber, chia seeds benefit bowel regularity. These fibers may also lower LDL cholesterol and slow down digestion, which can prevent blood sugar spikes after eating a meal and promote a feeling of fullness. Chia seeds are a very good source of ALA omega-3 fatty acids. Just one tablespoon of chia seeds contains 2.5 grams of ALA. Omega-3 fatty acids protect the heart by lowering bad cholesterol, blood pressure and inflammation. Inflammation can put strain on blood vessels and cause heart disease. Chia Gel: Chia seeds absorb water quickly. Place 1/4 cup seeds in 1 cup liquid, stir well and cover. Allow to sit for 15-20 minutes until the texture becomes a soft gelatin. Add to smoothies and soups for a thicker consistency and added nutrition. Chia Pudding: Mix 1/4 cup seeds with 1 cup liquid such as milk (almond, soy, or dairy) or 100% fruit juice. Allow to sit refrigerated for 15 minutes. Add nuts, chopped fresh fruit, or cinnamon if desired. Egg Replacer: Can be used to replace whole eggs in baking. For 1 whole egg, mix 1 tablespoon whole chia seeds or 2 teaspoons ground chia seeds with 3 tablespoons water. Let sit for at least 5 minutes or until the mixture thickens to the consistency of a raw scrambled egg. Cereal Topping: Sprinkle a few teaspoons into breakfast cereals (hot or cold). Baking: Stir into cake/muffin/bread batter. Stews and Soups: Stir into stews or soups. Sauces and Marinades: Stir into salad dressings, sauces, and marinades.